Already in 1935, although there were hardly more than a dozen members of Opus Dei, St. Josemaría had thought about its expansion from Madrid to other Spanish cities. The start of the Spanish Civil War made it impossible to carry out these plans immediately. During the time the conflict lasted, St. Josemaría carried on with his ministry, first in Madrid, at grave risk to his life, and later, in Burgos, after making a dangerous crossing of the Catalan Pyrenees. In Burgos, a town of Castile, he dedicated himself tirelessly to renewing contact with those who formed part of Opus Dei, and to his other priestly activities. Taking advantage of the time he now had, St. Josemaría decided to restart the project of his doctoral dissertation in law, centering it not on the subject he had decided on before (the documents he had left in Madrid were practically lost) but on an interesting ecclesiastical reality that existed in Burgos: the quasi-episcopal jurisdiction of the abbess of the Monastery of Las Huelgas. In 1939 he presented and defended his doctoral dissertation. Five years later, completing and amplifying his research, he published his third book, an extensive monograph on The Abbess of Las Huelgas. The difficult war situation had slowed down apostolic development, but had contributed to the consolidation of the vocations of the first members of Opus Dei. The 1940s witnessed a strong expansion of Opus Dei which, in a short time, was established in several of the most important Spanish cities. St. Josemaría dedicated most of his energy and time to spurring on this expansion and to attending to the new vocations, making this work compatible with the preaching of numerous spiritual retreats for priests. During this time of ecclesiastical reconstruction, of healing the wounds caused by the war, various bishops, knowing St. Josemaría’s priestly depth, approached him to request his collaboration. From then onwards, however, there was no lack of strong adversity that St. Josemaría bore with serenity and a refined supernatural spirit. He never lacked, in those difficult circumstances, the encouragement and blessing of the Bishop of Madrid-Alcalá, Leopoldo Eijo y Garay, who had followed the development of Opus Dei from its beginnings. To publicly show his support, Bishop Eijo y Garay granted Opus Dei its first written approval in 1941. On February 14, 1943, St. Josemaría found the solution to one of the questions that had been worrying him most: a way to define the presence of priests in Opus Dei. On this day, during the Mass, he received the inspiration to create the Priestly Society of the Holy Cross, a priestly association in which members of Opus Dei who became priests could be incardinated. Some time later, in the same year, after the agreement of the Holy See had been obtained, the Bishop of Madrid proceeded to its canonical establishment. 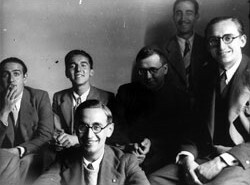 In 1944 the first three members of Opus Dei who had studied for the priesthood were ordained.